SEIB Insurance Brokers granted a total of £100,000 to charity at its Charity Awards luncheon on 22 March. 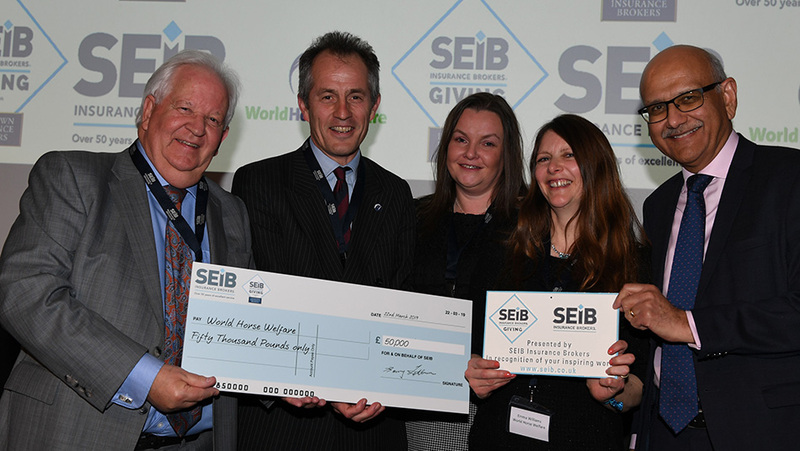 SEIB’s Chief Executive Officer, Barry Fehler presented a cheque for £50,000 and a commemorative plaque to Roly Owers and Emma Williams of the winning charity, World Horse Welfare. Nine other charities reached the final voting stage of the SEIB Charity Awards and received a further £50,000 from SEIB between them. The SEIB Charity Awards have strict entry criteria; only small and medium charities are eligible and the grant has to be awarded for a specific project. This is to ensure that the money granted will really make a difference. The winning project for World Horse Welfare was for vital new equipment, including a new tractor and trailer and a drone with a hi-res camera to help locate horses in need of help in hard to reach locations. Redwings Horse Sanctuary took the runner-up grant of £15,000 for its Horse Hospital Treatment Room project and the smallest charity of the finalists, the Welsh Pony Rescue and Rehoming Charitable Trust, took £10,000 for third place for its Every Life is Precious project. In fourth place was the Animal Health Trust, which was awarded a grant of £5,000 for the Digital X-Ray Appeal which could help diagnose new orthopaedic conditions. The other finalist charities, each receiving a grant of £2,000 each were; Bransby Horses Rescue and Welfare, Lindsey Lodge Hospice, Once Upon A Smile (also awarded £10,000 for winning Best Small Charity), James Hopkins Trust, Wildlife Aid Foundation and the South Essex Wildlife Hospital. Featured image: SEIB Insurance Brokers CEO, Barry Fehler and directors, Suzy Middleton and Bipin Thaker present the SEIB £50K for Charity cheque to Roly Owers and Emma Williams of World Horse Welfare.